IT ALL COMES DOWN TO THIS! The Big East Championship and a BCS berth are all that's at stake. It's the mighty Bearcats of UC vs. the wimpy Orange of Syracuse. 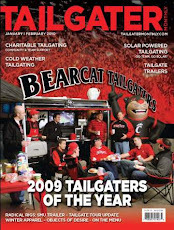 It's the last home game of the 2008 season and the last time I checked, the Bearcat Tailgate Crew has rocked them all! For the last time this season, Join the Bearcat Tailgate Crew this Saturday to cheer the Bearcats on to a BCS Bowl and give thanks to our Seniors for the exciting season we've been able to lay witness to! The game kicks-off at noon and the party will begin at the Schiel School Parking lot at 8:30 AM. This week's theme is Kegs & Eggs (round II). We will have plenty to eat and drink so feel free to stop by to grab a bite to eat and party with the Crew. The Ultimate Tailgate Trailer will be set up in the Schiel School Parking Lot (corner of W. Daniels and Vine across the street from Daniels pub). Special thanks goes to all of the tailgate wives / girlfriends for providing all of the side dishes throughout the season! As usual, EVERYONE is welcome. You DO NOT want to miss out on the last tailgate of the season! We hope to see you there!